Twenty years ago, college student Axel Prince Wolfe—heir apparent to his Texas family’s esteemed law firm and its “shade trade” criminal enterprises—teamed up with his best friend, Billy, and a Mexican stranger in a high-end robbery that went wrong. Abandoned by his partners, he was captured and imprisoned, his family disgraced, his wife absconded, his infant daughter Jessie left an orphan. Two decades later, with eleven years still to serve, Axel has long since exhausted his desire for revenge against the partners who deserted him. All he wants now is to see the woman his daughter has become, despite her lifelong refusal to acknowledge him. When the chance comes to escape in the company of Cacho, a young Mexican inmate with ties to a major cartel, Axel takes it, and a massive manhunt ensues, taking the pair down the Rio Grande and into a desert inferno. With his chance to see Jessie now within reach, a startling discovery re-ignites an old passion and sends Axel headlong toward reckonings many years in the making. I'd heard some great things about James Carlos Blake's crime writing, but this was the first book I'd read from a unique, award-winning author who's been dubbed “one of the greatest chroniclers of the mythical American outlaw life” and "one of the bravest" writers in America. It definitely won't be the last; The Ways of Wolfe is a rip-snorting, action-packed tale full of violence, criminality and philosophy. A true Border Noir, riding hard along the border, heavy on the noir. Axel Wolfe has spent twenty years in prison for a robbery gone wrong, his promise as a college student and part of a powerful Texas family ground away by years ensconced in a tiny cell. There's a light at the end of the tunnel, but it's still more than a decade away, so against his better judgement Axel teams up with a young prisoner whose drug cartel contacts can provide support for an escape. Freedom beckons, but at what price? 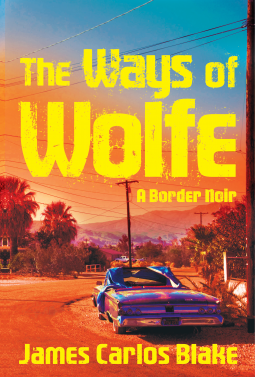 The Ways of Wolfe is the latest Blake tale centred on branches of the Wolfe family, a fascinating clan whose roots sprawl across both sides of the Texas-Mexico border and whose interests sprawl across both sides of the legal-illegal divide. Axel's promise saw him tapped by some in the family for the legal work, but he'd always found himself more drawn to the family's secretive 'shade trade'. Reading The Ways of Wolfe certainly made me keen to read Blake's other Wolfe family tales, and in fact pretty much anything Blake has written. He's a superb storyteller. His prose is punchy, full of violence and venom, but it flows beautifully, unfolding at high pace but never feeling rushed or 'thin'. I was immediately drawn into Axel's world, and his yearning for freedom and to reconnect with his long-lost daughter. As the escape plan is hatched and executed, peril appears at every turn. There's a great tension throughout the book, as Axel faces challenges both human and environmental. You know things are heading down a bad road for many involved, but it's a fascinating ride getting there. A terrific tale full of grit and style.